Jean: For your next book, I suggest HEAVY LIFTING: The Ethics of Elevator Encounters. (Alternative subtitle: The Ethics of Small Spaces.) Seriously. It could be a fairly short book, written to be accessible to the intelligent person-on-the-street -- you have a knack for that. ("Fun and provocative!" -- New York Review of Books.) 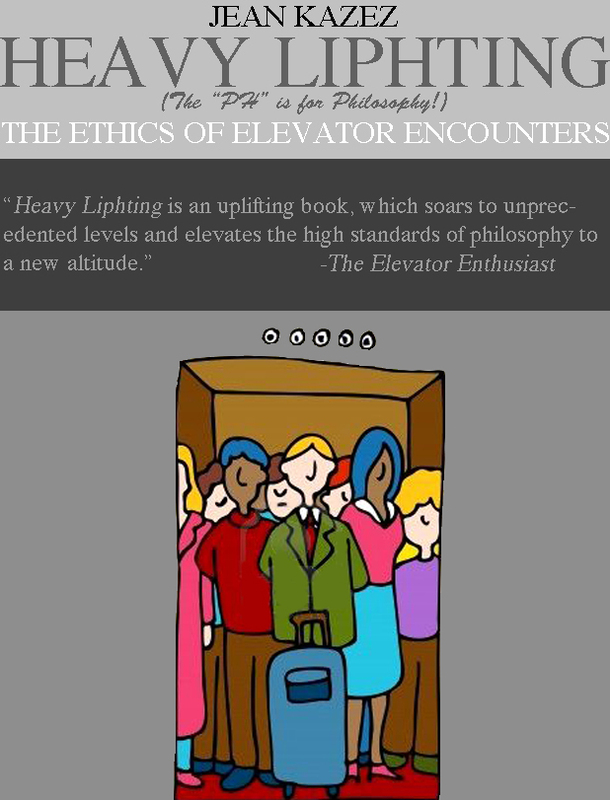 It would introduce the new philosophical field of "liftology" (less of a mouthful than "elevatorology"). By its nature, liftology is wider in scope than trolleyology, so there would be no shortage of ethical problems to write about. I've also been offered a lovely epigraph by Russell Blackford. ὁδὸς ἄνω κάτω --- Heraclitus ("The way up is the way down.") And publicity is proceeding nicely. It turns out there's a video of the elevator-gate program I was part of last week at the Fellowship of Free Thought (here in Dallas) and it's at The Friendly Atheist (my bit is at 60 minutes). All I need now is a ghostwriter and I will be rich! p.s. Don't you think my son should have put the Penguin logo on the bookjacket? Sheesh. Great cover. You have to go through with it now. The world is waiting. Full of win. Props to your son on the cover, what application did he do it in? Also: on a practical note, this is a book that writes itself. You are already sensitized to elevator stories, now you just open up the file drawer and start collecting. In a couple years you pull them all out, bring in your expert team to come up with some snappy connective tissue, and you're set! Full of win. The world is waiting. And all I'm doing is laughing! My son made that with photoshop--one of the banes of my existence. Somehow not so baneful if you're under 20. Glorious idea! Here's another (wonderfully wrongheaded) entry. OMG, another elevator incident. That's terrific! Victim in that case--a voice, but symbolic of nannies and matrons everywhere. Hmm!